Are restaurant receipts the new plastic straws? We certainly think so. 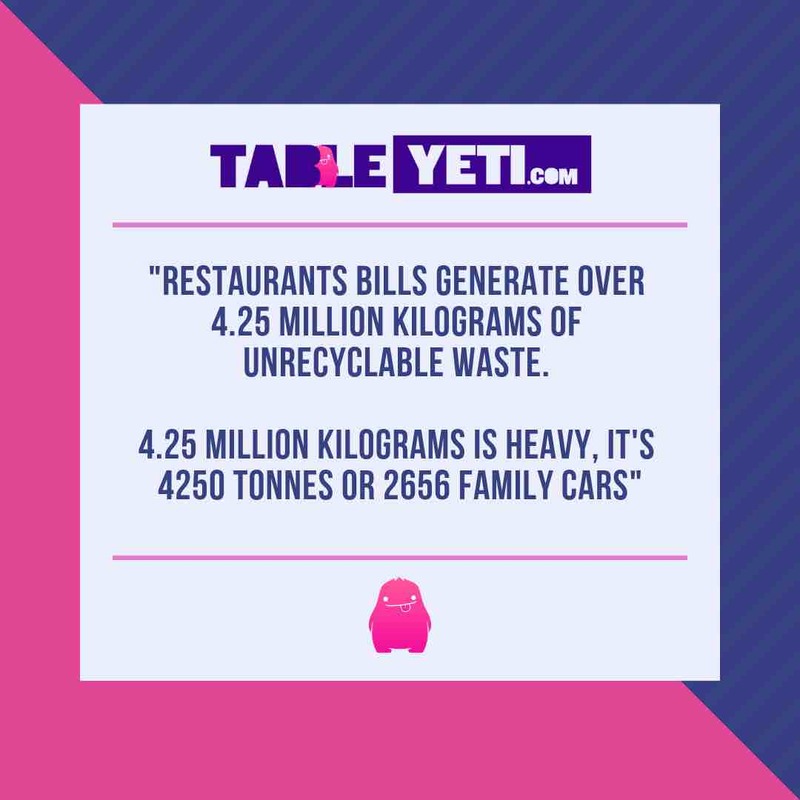 The statistics speak for themselves, so keep scrolling down to see how restaurant receipts contribute 4,250,000 kilograms to landfill each year and how many trees are needlessly chopped down to fuel our restaurant receipt addiction. 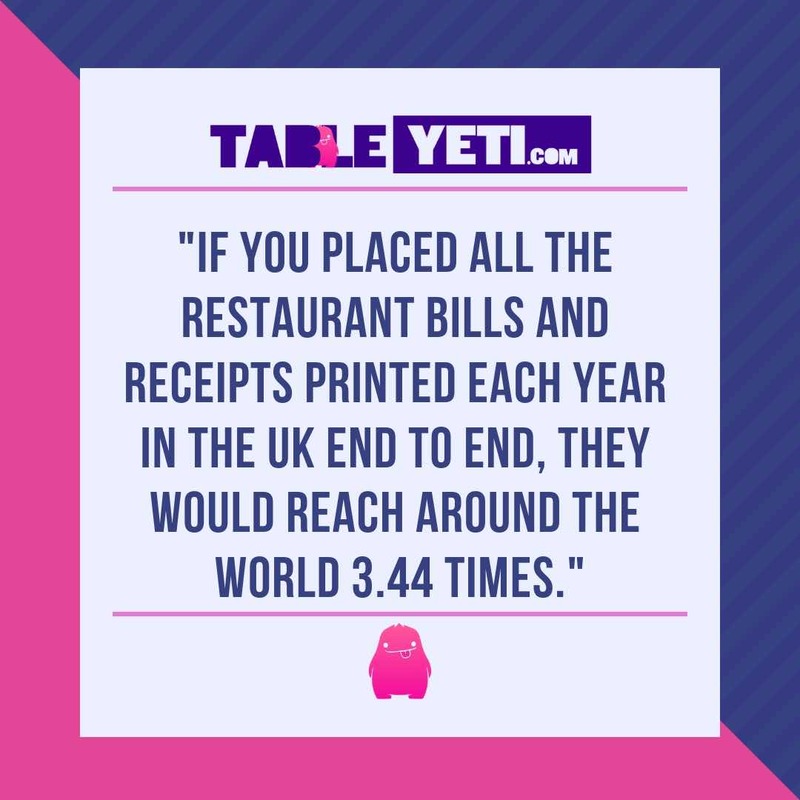 There are better ways to receive bills and receipts, at TableYETi we replace all paper bills and receipts with digital ones but with frictionless ease for restaurant owners and customers alike. The number of restaurant receipts printed each year. The headline figure is that restaurants print approximately 811 million bills and card receipts each year. "click to tweet"
Yes, you read that correctly, we estimate that restaurants print 811,000,000 bills and card receipts each year. That’s 10.3 pieces of thermal paper for every man, women and child in the United Kingdom. (Just from restaurants). According to Statista there are 86,627 restaurants in the U.K. which means that an average restaurant prints around 9361 bills and receipts each year. To put this in perspective, we calculate that the average bill/receipt length is 17cm. So if you lay all the restaurant bills and receipts printed yearly in the UK end to end, they would reach around the world 3.44 times. "click to tweet"
Oh and just a thought for you, these receipts are unable to be recycled, you can skip to receipts and bills can’t be recycled if you need to know why now, though I wouldn’t miss the next section on the effect on forests, it’s just as shocking. What effect does receipt and bill printing have on trees? 55,000 receipts (including bills) destroy one average tree, so with the average restaurant printing roughly 9500 receipts each year, it only takes six restaurants to remove a tree from the planet. "click to tweet"
With 86,627 restaurants in the U.K, that means the restaurant industry levels 14,437 trees each and every year. The average forest has 60 trees per acre, meaning the restaurant industry damages 240 acres of forest each year. or a forest 1/3 the size of the City of London, or 189 football pitches. "click to tweet"
According to Carbon Free Dining and the Green Earth Appeal, deforestation is a huge contributing factor to poverty around the world. Removal of trees by communities means that the land over time becomes unable to support crops. Which then, in turn, leads to failed crops and starvation in the poorest communities. 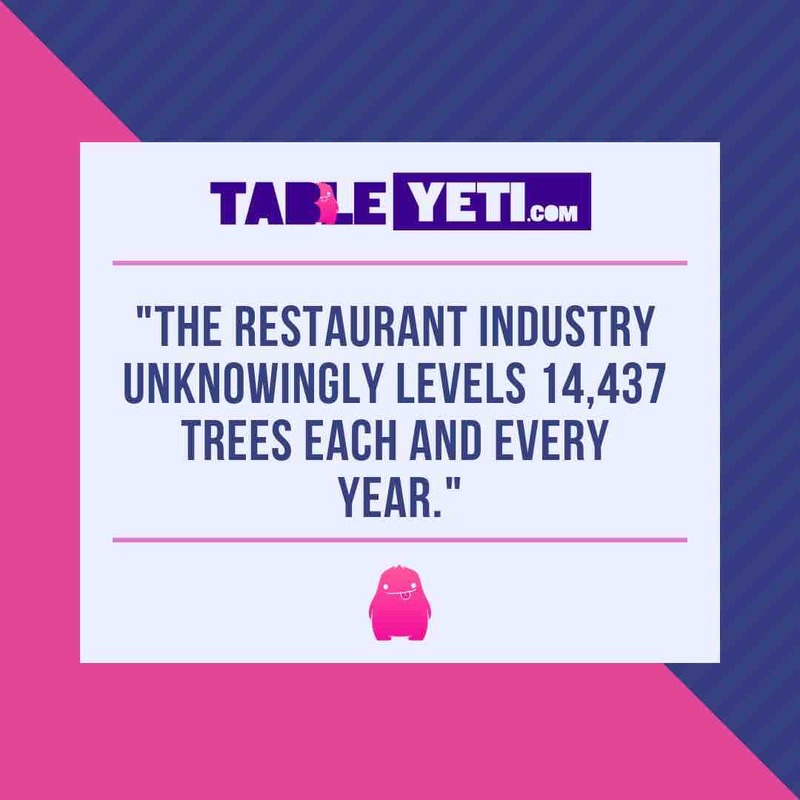 At TableYETi we’re of the firm belief that in 2019, in a world where Elon Musk can land a rocket upright, there is no need for the mindless destruction of forestry throughout the world. Receipts and bills can’t be recycled. Yes, you read that correctly, receipts and bills can’t be recycled and as such end up in a landfill. and all those little bits of paper add up. In the United Kingdom, it means over 4.25 million kilograms of unrecyclable waste. 4.25 million kilograms is heavy, it's 4250 tonnes or 2656 family cars. "click to tweet"
So next time you have a paper restaurant bill given to you remember that tiny bit of paper is one use only and will be buried in a landfill for the rest of time. 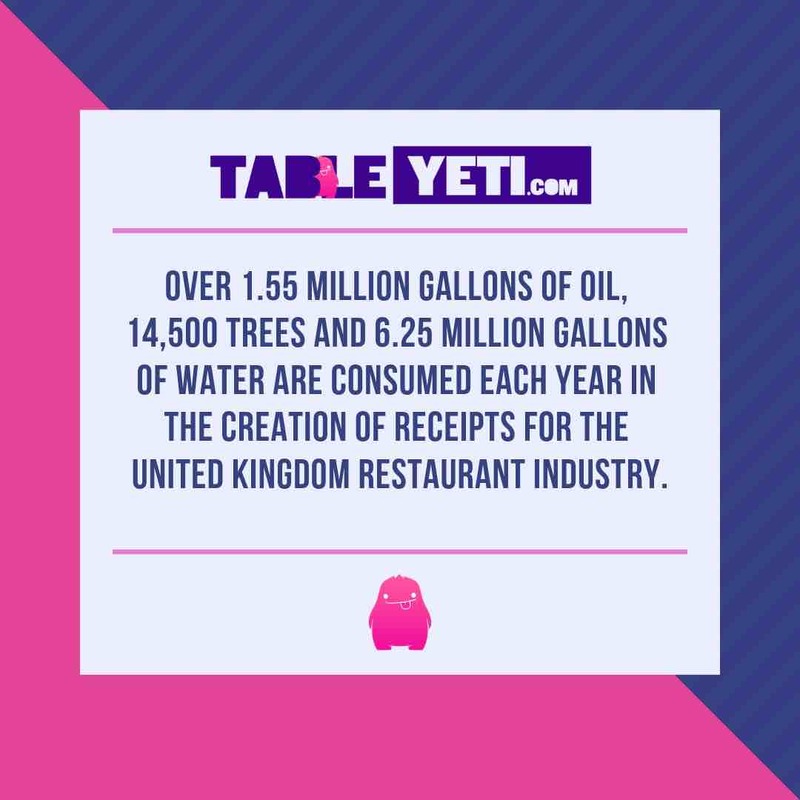 Over 1.55 million gallons of oil, 14,500 trees and 6.25 million gallons of water are consumed each year in the creation of receipts for the United Kingdom restaurant industry. "click to tweet"
and as mentioned in the section above, 4.25 million KG of used receipts end up in landfill each year. 1.55 million gallons of oil, produces an awful lot of CO2. With 42 gallons of oil in a barrel of oil, the production of bills and receipts takes 36,904 barrels of oil each year. Calculations suggest burning one barrel of oil to produce energy creates 433KG of CO2. Reverse the math and you get nearly 16 million KG of extra CO2 pumped into the atmosphere due to the production of paper receipts. Though it is good to note that this number is being gradually reduced due to the usage of renewable energy in the sector. Making paper uses vast quantities of water, and waterwold.com estimates approximately 85% of the water used is contaminated which needs chemical treatment before it is released back into the environment. Over the last two decades, pulp and paper producers have worked hard to improve the reuse of water in their production process. Positive improvements to the production process does reduce the environmental impact of paper usage for restaurants. Though reducing paper usage to zero is the only way to truly remove the environmental impact. If you think about it there is no real need for paper receipts anymore, in the same way, that there is no real need for sending paper letters around the world. We have better solutions, though it would seem restaurants have been slow to adopt them. "click to tweet"
Somethings in life are so important that they require their own infographic. 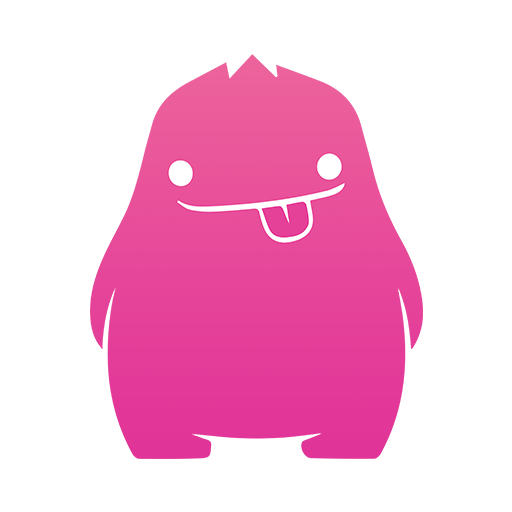 At TableYETi we truly care about the impact swapping paper bills for digital ones can have on the planet. We’re working tirelessly at TableYETi to convince the world to swap the old paper bills for our iPad based digital billing system. We strongly believe that our solution is 10x better than printing out bills and handing them to your guests, and it’s not just about the environment.TableYETi can do so much more, it can generate feedback on individual menu items, it can track your net promotor score over time, it can stop frustrated guests from posting reviews online and it can free up your waiting staff to do what they do best, rather than helping guests pay the bill. If you want to help us change the world, email [email protected] and a member of our membership team will get straight back to you.